How Can Improving A Website’s Search Rank Be Easy? There are dozens and dozens of advanced ways to improve search engine rank. I use (and teach) many of them with my own clients. Many SEO companies charge thousands and tens of thousands of dollars to the world’s top brands for applying these techniques with the hope of moving a site’s rank up a few notches. Out of those dozens of SEO fixes, there are a few that stand out as both extremely effective and relatively easy. They’re easy enough for almost anybody to set them up. Anyone who has worked with me knows that when I’m trying to improve a website’s rank, I always look first for the crossroads of effective and easy. Starting at these crossroads means that you can make a few small(ish) changes that will deliver noticeable results in a website’s rank. But first, here’s an intro into what search engine rank is and how it affects you. Simply put, search engine rank is the position that a website appears in a search results page. A search results page is known as the SERP. To say that a page “ranks well” means that the web page is toward the top of the search results. Though “search engine rank” can be generically applied to any search engine from Bing, to Yahoo, to Duck Duck Go, just about everyone is really just talking about Google. It’s not news to anyone that Google has, does, and probably will dominate the search market for some time to come. So even though you might be searching using one of the other search engines, when you hear “SERP”, think about how your site will appear on Google’s search results page. A more complicated explanation of SERP includes a number of Search Engine Ranking Factors that are thought to be part of Google’s search algorithm. There’s a lot of speculation about how Google ranks a website because no one except Google knows for sure. Their search algorithm is their intellectual property and they keep it quite private. Here’s a run down placed in order of influence of the top 4 widely used search engine ranking factors from MOZ. This the total number and the quality of all the links that point to any page on your website. These are all the links and the quality of those links that point to a specific page on your website. This is how well optimized your title, headlines, images, and paragraph text are in relation for your keyword. This includes content length, page loading speed, content readability, and uniqueness of your content. You can see that MOZ lists a total of 9 ranking factors. I’m listing only the first four and skipping the rest because they have the greatest impact on your site’s search engine rank. In fact in this article we’re only going to really cover numbers 3 and 4. I’m not covering the rest because we’re going to stick with effective and easy. Remember? Both Domain-Level Links and Page-Level Links refer to links coming into your site from other websites. These are at the top of the list above because they’re believed by just about everyone to be the two most important factors that Google uses to rank a website. Domain and Page-Level Links are incredibly effective at boosting your website’s position on the SERP but they can take a long time to achieve. This makes them not so easy. Instead of focusing on these harder to attain outside links, we’re first going to focus on improving on site SEO. The two on site factors that most affect your SEO are Page-Level Keyword and Content-Based Features and Page-Level Keyword-Agnostic Based Features. The other ranking factors on the list will definitely have an impact on your search engine rank but they take a lot longer to implement and won’t give such dramatic results. Now you know where to focus your search engine optimization efforts but we haven’t looked at why you should bother with SEO at all. There’s one statistic that should convince you. In addition to the 93% of online experiences begin with a search, 77% of those searches are done with Google. That’s huge! Combine that with recent data about click through rate (CTR) in relation to position on the search engine results page (SERP) and you reveal an important story. By far, the majority of clicks on the SERP are on the first 5 results. Finally, combine this data with the average value of a visitor showing up on your website. What’s a new lead worth to you? $100? $1000? More? Without a doubt, I’ve made my case for the importance of SEO. It’s obviously no longer a question of whether you can afford to spend the time and money on SEO. Without a doubt, it’s a question of how long can you afford to ignore it. To throw around some more big numbers, 27% of all the websites on the planet uses WordPress. WordPress is this popular because it’s actively developed and improved by a large dedicated team, it’s regularly updated, and it has an even larger community of third party and private developers that make plugins for it. For you, this means there’s a great collection of plugins to help optimize your content. Here are my preferred plugins for WordPress SEO. WordPress uses modern coding practices and creates well formatted and, equally important, standards compliant code. That makes it search engine friendly already. Yoast SEO makes WordPress even better by adding SEO specific tools. At over 1 million downloads and a 4.7 out of 5 stars rating, Yoast SEO is one of the most popular WordPress plugins ever. For the purposes of this review, I’m writing about the free version of the Yoast SEO plugin. There’s a premium version but, honestly, I’ve never had cause to try it out. The free one has always been enough. Yoast SEO gives you a convenient way to address Page-Level Keyword and Content Based Features. With this plugin you can easily set page meta title, meta description, and url. There’s also a field to add your keyword or key phrase. 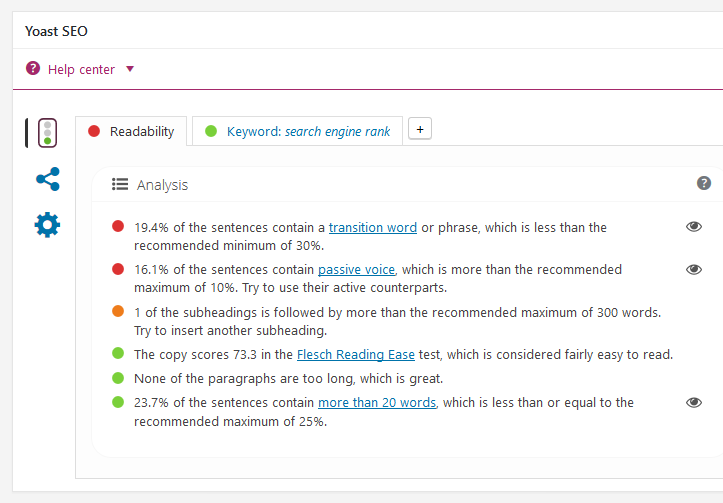 Yoast SEO’s built in content analysis additionally shows you the frequency that your keyword appears in your content. This is your keyword density. The plugin uses some handy gray, red, orange, and green indicators to let you know how close you are to the recommended best practices. These screenshots are from this post as I’m drafting it. You can see how Yoast SEO gives helpful feedback that gives you a chance to write a much better article. 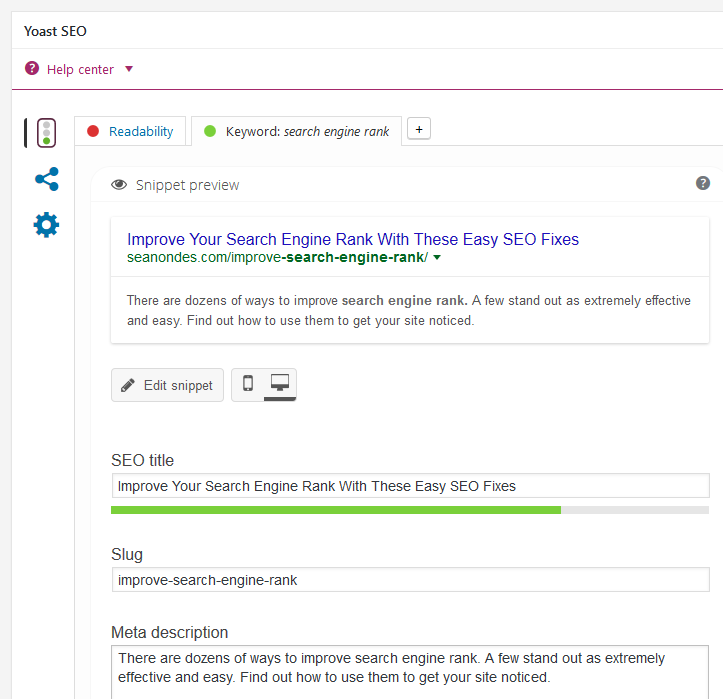 Further, as of the most recent updates, Yoast SEO updates the analysis live as the content changes. Built in readability scoring gives you a chance to improve some of your Page-Level Keyword-Agnostic Based Features before you hit that publish button. 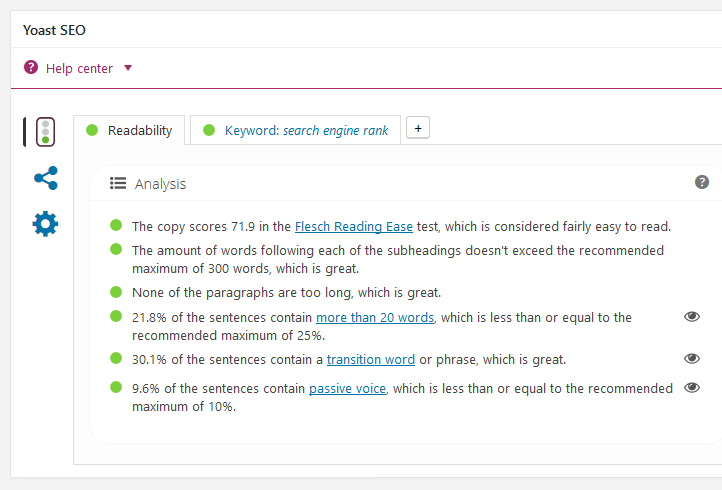 Yoast SEO uses Flesch-Kincaid reading ease, use of passive voice, sentence length, paragraph length, and the use of transition words to calculate the readability score. You can see that I have a little readability work to do before I publish this! Here’s what it looks like after a few key changes. Broken links are almost inevitable, especially if your website has been around for a long time. It doesn’t seem like broken links damage your search engine rank though. Even if your search engine rank isn’t affected, broken links can damage your reputation and your site’s usability. They’re untidy and make your content look “not so fresh”. Broken Link Checker is an incredibly useful plugin. You can install it and check every link in every piece of content on your site. So if you have a broken internal or external link, Broken Link Checker will let you know. It’s one (major) downside is that it is always running in the background and checking your links. This is what it’s supposed to be doing but it can take a lot of resources. Evidently, because of the strain it puts on a server some hosting providers like WPEngine have blocked this plugin on their hosting accounts. As a workaround, I simply leave the plugin deactivated until I need it. Then there’s no big server overhead that slows down my site. Checking broken links is part of my routine website maintenance. If you have a hosting account with WPEngine and need an alternative. There are plenty of non-WordPress ways of checking for broken links. One of the best services you can use is Google’s own Search Console (formerly known as Webmaster Tools). In addition to checking broken links, you can use Google Search Console for many, many other reasons. If you don’t have one already, definitely create a Google Account and set up Search Console for your site. I do it for every client site that I work on. It feels almost silly to bring up the importance of having a mobile friendly website. If for some reason you’re not yet convinced, here are some solid numbers that may change your mind. One final fact to nudge you just a bit more. In March 2016, Google further increased the penalty it assesses for mobile un-friendly websites. The penalty causes websites that aren’t mobile friendly to appear much lower in results when a serch is made on a mobile device. This means that when someone on a mobile device searches for what you offer, chances are they’re going to give their business to your competitor. Make sure your site loads fast. It’s long been known that Google takes page loading speed into account when it ranks a site. To put things in perspective, page speed matters to Google but not nearly as much as a site’s relevance. Here are some of my favorite tools and WordPress plugins to speed up your site. GtMetrix is an online tool that will check your page loading speed using Google’s Page Speed and Yahoo’s YSlow. They give great WordPress feedback advice about improving page loading time. I hope that it’s clear that improving your website’s search engine rank is nothing to fear. First, focus on the easy and effective ways that will take the least effort to deliver noticeable results. After reading this guide, I hope you can more easily get your site noticed. Let me know if you want a hand or some personalized advice.